A while back I had the fun of offering virgin shooters at a community teen dance. One of the drinks offered was a virgin apple pie shooter which I originally came up with back in the Fall of 2014, and which you can find the recipe for here. Not knowing how much of any one drink would be ordered – I made a huge batch of the butterscotch syrup required to make the drink. I found the recipe for butterscotch from a blog by TreasuresBrenda where she tested a number of Butter Beer recipes. You can find her blog post here. As my eldest daughter and my neice are huge fans of Hairy Potter (oh and so am I) I decided to see what our family thought of these recipes that Brenda posted on her blog. The first recipe she created had a rockin’ version of butterscotch syrup and a couple option for how to mix the drink up.Our family tried each option to see if we agreed with Brenda. The second recipe was a video she had a link to by working class foodie the link to that recipe is here. This recipe is more complicated to make and we didn’t find the recipe notably better than the first option. Back to the internet! Wizardingworldpark.com had a handful of recipes – many using pre made butterscotch syrups, toppings and butterscotch chips. Really, chips? meh! There was only one recipe that was interesting: Recipe #2 on the list suggests adding cinnamon, cloves and nutmeg with butter and sugar and then mixing with icecream and refreezing. To serve it’s a float of buttery ice-cream and cream soda. If the soda is hot, it will melt the butter, but if it’s cool? Butter lumps? While the idea is interesting, I would like to try this by making a butterscotch syrup out of the butter and sugar, adding the spices and then mixing with the iced cream, to see if that lets the drink be served cold more readily. Recipe #1 from this blog is the recipe from the Youtube video I referred to earlier. Hmm. So I went back to the first recipe that my kids loved and decided to find a way to make this one work. Since I was looking for a darker beer – I simply added 1/3 pepsi (or cola) to 2/3 ginger ale and topped with the required 2 tablespoons (or so) of home made butterscotch. Voila! A dark beer that has a strong butterscotch flavour, still has some kick and isn’t deathly sweet. I tried this on my niece – and her friend. The verdict – yum, can I have some more? This winter for a Christmas present to myself I purchased a large quantity of specially loose teas from a variety of companies. Over the past months I have been trying each out and deciding which I liked and which I didn’t, and as things go the favourite teas have been consumed leaving me with the ok teas and the ones I don’t really enjoy. Not wanting to simply throw away these “less preferred” teas, and being parched during the somewhat hotter weather now that we are into summer, I set about looking for ways to use these blends in cold drink concoctions. And as it turned out, these “lesser” teas became the preferred choice for cold iced drinks with some simple additions. So now my home is often filled with pots of tea in the more literal sense. As I don’t have a tone of tea pots, and really only need containers to heat water, steep tea and allow to cool, my kitchen cooking pots have found yet another use. My stove top becomes tea steeping central as I steep, simmer or even boil loose tea in water to the desired concentration – works best with a tea infuser/strainer – and then turn the resulting liquid into syrups. What are some of my creations? Here is what’s currently brewing. I actually really love chai tea hot. In past blogs I have used chai tea to make various drink creations and had practically run out of tea. Digging through my cupboards I found a small sample of the Chocolate Chilli Chai which I had not yet used – preferring the more traditional flavour. So I rallied and mixed the last of my favourite tea with this new mix to make something fun for summer. This tea requires boiling the loose tea and straining it or using a tea infuser as tall as the pot of choice, I prefer the latter. Place tea into infuser, and set into pot of water. Bring to a boil and simmer about 10 minutes to get a strong brew. Remove tea infuser and add last two ingredients, bring back to a boil and allow sugar to dissolve completely. Cool and store in bottles. When ready to serve pour over ice to fill half the cup, top with cold water or milk and serve. My favourite chai is spicy and strong. While this drink qualifies on both counts, I realized today while frequenting my local “specialty cafe” that a good chai needs honey. This recipe used sugar and I think would benefit from replacing some of the sugar with honey. I have still not mastered that perfect chai taste and have not figured out how to get the right balance of strong, sweet and spicy. As a result the the specialty cafe in my town still sees me willingly pay $5 for a tall cup of Chai at least once a month so I can get my fix. Two traditional non-caffinated teas that I have never enjoyed are camomile and mint tea. I am not sure if this is because those are the most commonly offered to kids and I tired of it years ago, or if it brings back memories of sleepless nights, but either way I won’t drink these hot. One of my Christmas purchases was a herbal tea called Pink Lady Herbal Blossom Tea. The description indicated it was a blend of rose petals, hibiscus and mint. Unfortunately for me the mint overpowered the more subtle herbs and this tea got put in the “lesser” pile. With summer upon us, the idea of mint juleps came into mind, and the tea came out from it’s dark corner. Preferring a milder mint taste I added some black La La Lemon Tea to round it out. Boil water in pot and place tea (in infuser) in pot to steep. Simmer about 10 minutes (don’t boil unless you want a stronger black tea taste) then remove infuser. Add sugar and bring to a boil until sugar has completely dissolved. Allow to cool and poor into bottle to store. When ready to serve simply pour 2-3 oz over ice in tall glass, add water or club soda to fill and serve with a fancy straw. Hooray for the resurrection of mint tea into something that doesn’t remind me of bed time and toothpaste! While a true mint julep this isn’t, it is a refreshing alternative. I prefer it with club soda as it adds sparkle and makes this a bit more upscale. I am not sure what the tiny bit of hibiscus and rose in the teas blend add to the mix… Something to test would be to add a drop or two or rose and/or hibiscus water to the drink to see if that takes it to the next level. This is based on an Epicure Recipe for Berry-lemonaid Herbal Iced Tea which you can find the original recipe here. The recipe calls for Scarlet O Herbal Blossom tea infused syrup, fresh squeezed lime or lemon juice, and some berry flavoured mixes. For my recipe I chose to go more natural with the berries, and cheat with lemon juice. The tea itself is a blend of honeybush, elderflower and hibiscus. Boil water in pot and add tea infuser full of tea. Turn heat down to low and allow to steep keeping water hot but not simmering (this tea is strong). Remove infuser and add sugar and lemon juice and bring to a boil until sugar is dissolved completely. (If using stevia you won’t need to boil as it will dissolve quickly). Allow to cool, pour into bottles and store. When ready to serve pour about 2 oz over ice and a sprinkling of frozen blueberries, add 1 oz of lime cordial, top with water or club soda and serve. This is my favourite tea of the three, blended with the lime and club soda it adds a kick that cuts the thirst on a hot day. The original herbal blend comes through to give an intriguing and pleasant taste. Served without the blueberries is also nice. I am on my second bottle of syrup and summer has only just begun. This tea is actually fabulous blended with the Pink Lemony Blossom tea, after their first tentative sip my girls both finished up two glasses at dinner tonight. Making virgin drinks that taste like the original drink has it’s challenges. To make a virgin mudslide required a coffee syrup and a home made Irish Cream without the Irish Whiskey. Cut with milk this drink was tasty – but sweet. To make my latest masterpiece the Tidy Bowl Shooter, I used curaçao syrup but cut it with Jamaican Ginger Beer so the sweetness was balanced by spice and fizz. Some shooters though are an epic fail – especially when blending multiple syrups instead of multiple liqueurs. While liqueurs are sweet they also have a kick of alcohol, the syrups… well they are simply sweet. This was most apparent when I tried to use my butterscotch syrup in place of butterscotch schnapps. I tried something called a Butterfly shooter from BarNoneDrinks: half Butterscotch and have Irish Cream right? Well I had both of these – in syrups so it should be a piece of cake! Nope. Thick and utterly impossible to drink – ick. Similarily the pumpkin pie shooter made from Butterscotch Scnapps, Baileys and Goldschlager also doesn’t translate well into a combination of syrups. There is also a similar mix called the oatmeal cookie using vodka and cinnamon schnapps, but again too much syrup and nothing to cut it with. So how to fix this dilemma? It occurred to me that one needs to balance the sweet with something, similar to in a cocktail where bitters are used to balance the sweetness. And so far, in other more successful shooters, I have used the addition of a cream, a sour mix or a fizzy spicy addition to balances the sweetness of a syrup based skeeters (virgin shooters). So what options are left? Salty? More Sour? More Fizz or Spice? Or do some drinks simply not convert to the virgin option no matter how much you want them to? So there is my dilemma – and my latest challenge. Sugar and Cloth had one way to meet this challenge. She blends sweet caramel, ice-cream and milk with a dash of salt. What a better way to cut sweetness than cream and salt! You can find her recipe here. Another option is to relish in the sweetness. There are a ton of shooter recipes that are imitating food. The Oreo Cookie Shooter that blends chocolate, coffee liqueur and Irish cream – all easy enough to replace with syrups to make a strong sweet concoction. So why not serve with a glass of milk just like the cookie, as a chaser? Or to be more creative, invest in some shooter bomb glasses and serve the milk around the shooter – just like a kid would dip his oreo in milk. We tried this recipe with non alcoholic syrups… Tasted nothin’ like an Oreo Cookie – unless you are dipping them into coffee! So this is just the beginning of my journey – and more experiments are needed – but I am hopeful. 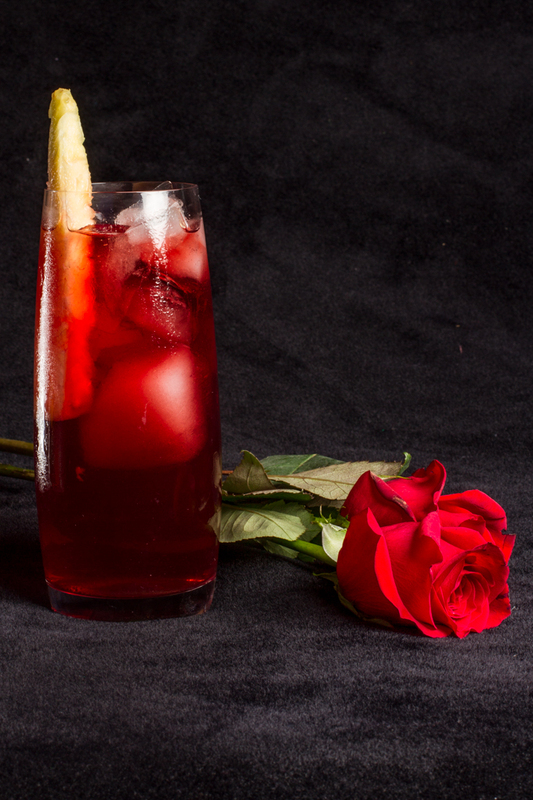 Four very different Valentines cocktails to consider serving your sweethearts this year. 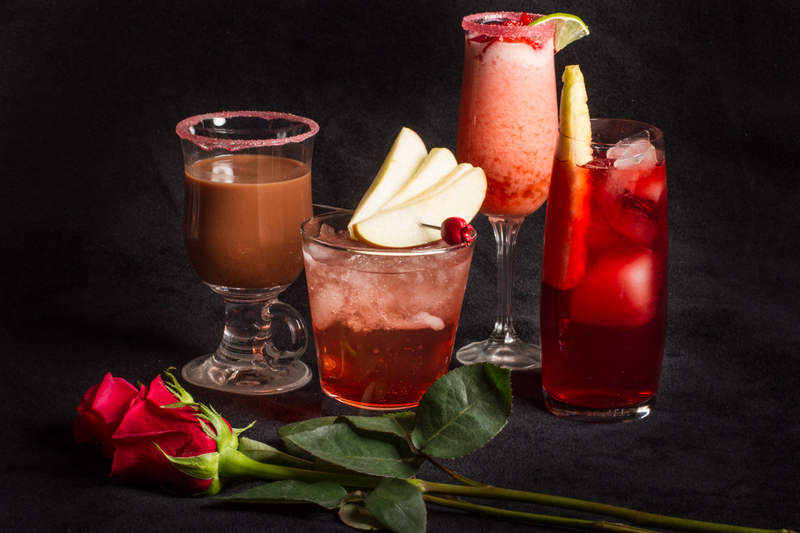 From left to right: Mexican Chocolate Mocktail, Red Apple Delight, Brazilian Strawberry Limeade & Hibiscus Mocktail. When I think about some of my most special Valentine’s Day memories they are with family. Going back as far as my childhood, I remember special valentines breakfasts where my mom made a special meal complete with strawberries, fancy pancakes and a chocolate. Dinner often had a little treat for each of us kids, and a card from my parents to each other that once read created a sentimental look in their eyes that us kids at the time didn’t understand. At the time for us kids, Valentines was about getting (or not getting) cards at school, and about chocolate and candy hearts, then later as a teen about who would (or would not) dance with you at the Valentine’s dance. And now as a parent and wife, I have come full circle and Valentine’s Day is again about family, sharing a special meal with them and a sentimental card with my spouse. 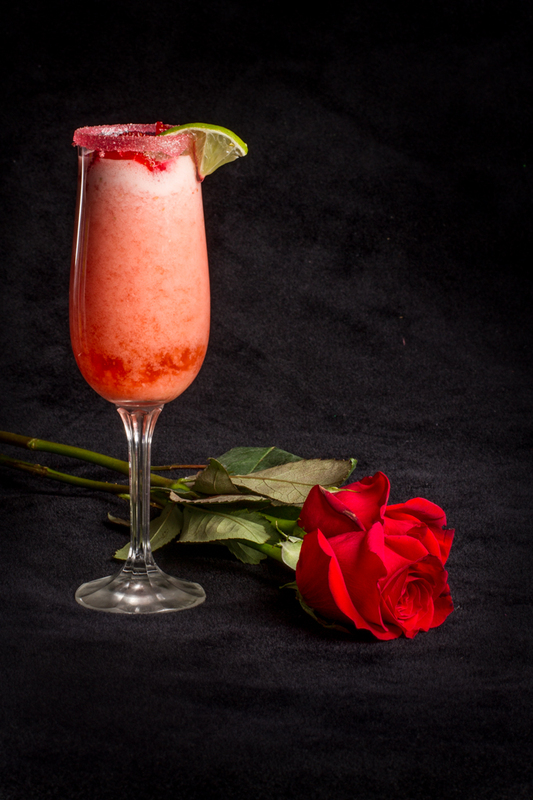 So as a mocktail enthusiast – I wanted to share some special Valentine’s drinks this year as part of our Valentine’s Day celebrations. 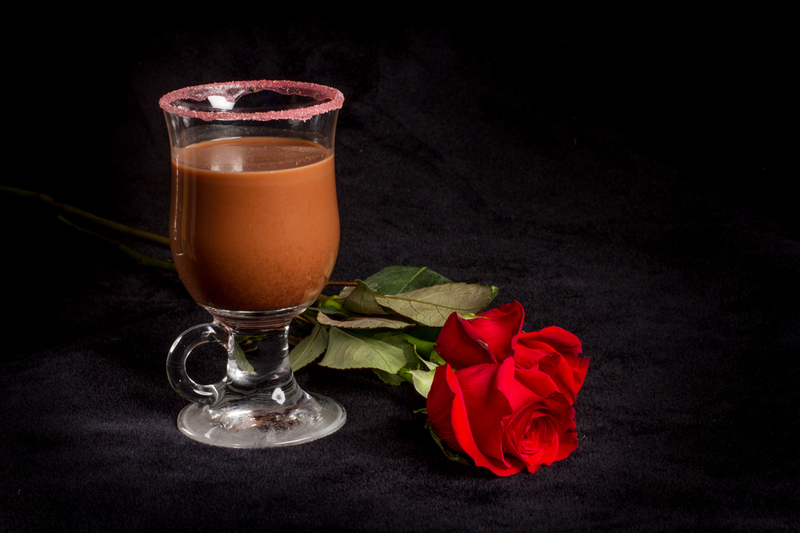 The web is full of great pink, red and chocolate Valentine’s Mocktail ideas so we decide to try a few this Valentines weekend. At Christmas I treated myself to a couple of Herbal Blossom Teas by Epicure that I hoped to try out in mixed drinks. One in particular called Scarlet O included rose petals, hibiscus and elderflowers – three ingredients that are hard to find up north. I also picked up rose water and hibiscus water on my trip to Vancouver – and so this recipe by realsimple.com jumped out at me when I was surfing the web. You can find the full recipe here and my adaptation below. The recipe serves 6. This is not a very sweet drink and resulted in mixed reviews from my family. The colour and presentation are fantastic and the drink has a very interesting flavour complex. But, my two girls found it needed additional sweetener and more ginger ale than the recommended amount, and even with a shot of grenadine and added ginger ale only one of the two (the youngest interestingly enough) finished her drink. All four of us found the drink tasted more like tea than a cocktail, and this drink rated the lowest for the majority of our family. Would it work for an adult party? Perhaps, with a twist of pineapple juice thrown in. I would also consider trying this with Dark Gingerale to see if the flavour blend works better. Having no Red Zinger in town though, I am not sure what a different Hibiscus Tea would do to the drink. Kid-o-metre 1/5 Not enjoyed without adding extra sugar and pop, then only moderately. Taste: 3/5 Very unique a flavour and for a sophisticated palate. Simplicity: 5/5 Nothing hard in this from a mixologist perspective. Don’t even need a cocktail shaker! Ingredient finding: 3/5 Red Zinger was not available, an alternative is thanks to a local home businesses – remaining ingredients easy to find. This recipe by SoberJulie looked like a elegant sparkling apple juice coloured by a touch of grenadine. I was intrigued by the addition of sweet lime juice suggested and decided to give it a try at our family Valentines dinner. You can find her recipe here. The basic ingredients are also below. This make 4 servings. This drink reminded me too much of Sunripe Apple Lime blend – while the presentation was elegant the drink itself could have used more fizz than it called for. That begin said, my youngest chose this as her second favourite drink of the four we tried over the evening. Kid-o-metre 3/5 Kids had mixed feelings about it. One didn’t finish her glass and said it was too lime tasting for her. Taste: 2/5 Isn’t really special enough and too much like something out of a carton. Simplicity: 5/5 Very easy to make. The garnish is a little tricky, but by the third one I had mastered it. Ingredient finding: 5/5 All ingredients used to be easy to get locally, however my store has stopped carrying grenadine… sigh! The next two recipes were from a list of 6 truly inspiring Valentines Mocktail ideas by One Good Thing by Jillee who had come up with amazing recipes including exotic ingredients like pomegranate juice, papaya nectar, blood orange juice as well as more common (but hard to find in my town) ingredients like white grape juice and colourful sorbets. I wish I could try all her ideas, but am settling on two – the first one using strawberries and lime and the last using chocolate. This recipe is similar to something I had thought of while considering how to incorporate strawberries and cream into a drink. Jillee uses a combination of simple syrup laced with lime, strawberry puree and sweetened condensed milk to create a pink tinted creamy mixture. You can find her recipe here and the ingredients you will need are listed below. This drink makes a full pitcher (about 2 litres) ready to serve to 8 to 10 guests depending on size of glass. This drink rated in the top two for the majority of our family. The blend of fresh lime juice, strawberry puree and condensed milk is very sweet and natural tasting and I was amazed at how sweet the drink was considering that the sugar syrup is very light (1:6) and the only other sugar is in the condensed milk (6 tbsp in an entire batch). I used fresh strawberries for this recipe (about 400 grams) and blended them with half the sugar syrup after blending (then straining) the limes with the other half. The original recipe calls for pureed berries – and having no pre-pureed strawberries I improvised. This may have mixed the drink more effectively – and also added more sweetness from the strawberries since they were almost liquified in the blender. 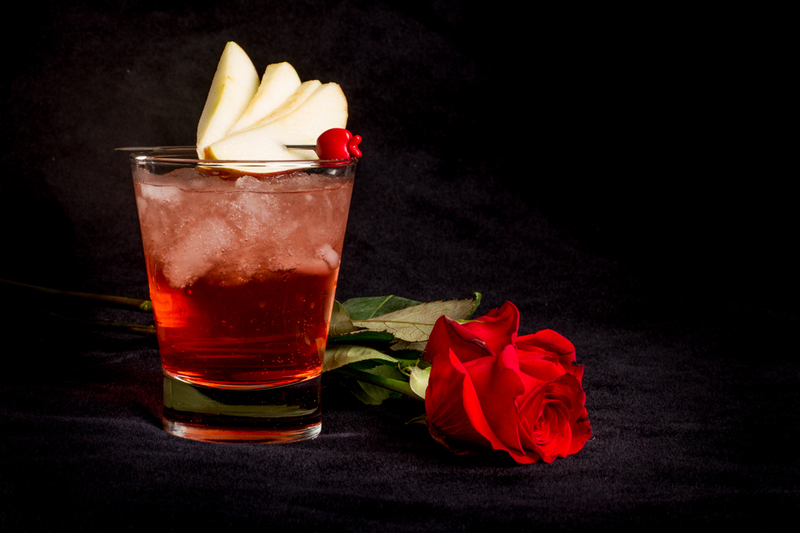 I would serve this at any Valentine’s Day party – and happily pay for this drink in a bar if it was available. Kid-o-metre 4.5/5 Kids enjoyed it, but it was not the first choice for either, but both finished their glass! Taste: 4.5/5 Fantastic! Truly worth the work and cost of ingredients and it’s a huge party sized batch. Ingredient finding: 5/5 All ingredients for this were readily available at my local store in my little town. Chocolate is a must at Valentine’s Day as is cinnamon. Infact if I had to choose, I would pick the cinnamon hearts over a box of chocolate any day. So when I read the ingredients for this Mocktail on Jillee’s website, that she adapted from HGTV.com by adding a red sugared rim, I had to try the recipe out. I would have liked to adapt it slightly myself – by adding crushed cinnamon hearts instead of red coloured sugar – but cinnamon hearts are not available this year locally. The ingredients are below, and you can check out the links to see the full instructions. Wow! I am not a huge chocolate milk fan, but the cinnamon, cocoa and almond milk make this drink an absolute dream. This drink rated equal to the last recipe in our home. The recipe makes a perfect four servings and there was not a drop left in any glass. I would still love to try this with crushed cinnamon hearts – sigh. Maybe next year! Kid-o-metre 4.5/5 Kids chose this as first and second choice of the four drinks. Taste: 4.5/5 Like I say… Wow! This does require almond milk – which isn’t cheap, but well worth the investment. Simplicity: 5/5 This is very easy to make. Requires some time for cooling of the ingredients, but no special tools. Ingredient finding: 5/5 All easily found locally. I would love to create something new, and may spend a little time on Valentine’s Day coming up with my own creation, but while Valentine’s is about love – and I love mixology – it’s about relationships. So my goal for the day is to spend as much time with those I love as I can, being a mom and a wife and a friend. Virgin drinks are not new. Mocktails have been around for a while. According to oxforddictionaries.com the word originated in the 1930’s. According to a blog written by FASD prevention the term is more recent starting in the 1970’s. Ok, so Mocktails in concept may be almost 90 years old but more likely originated about 40 years back. Shooters on the other hand are a bit harder to pin down. One story says that the first shot glass may have been as old as the 1930’s with the possible origin of a “shot” of alcohol being from a story of a man who shot a barrel of whiskey with his riffle to prevent a bar from opening in his area. After that the coin “a shot of redeye” became popular according to wikipedia. Looking further a shot may refer to the equivalent in alcohol to one bullet, or have to do with the prohibition, and similar to a jigger of rum or whiskey. Most sources agree that the shot glass is about 90 years old. Wikipedia and the net seems to have no mention though of the origin of the shooter drink – only a list of recipes and the general idea behind the drink. Heh? Can’t seem to find anything on the internet to tell me… but I am guessing it was in the last 30 years, as my parents are not familiar with the concept. Teens today are though, and early adults especially. Each generation the age kids/youth start to try alcohol decreases, even if drinking law age limit remains steady. The availability of alternatives to common drinking practices, like cocktails and shooters, is one way that people can enjoy social activities and the idea of mixed drinks without the consequences, and younger individuals who wish to be like their parents (or older friends) can have fun without breaking the law, getting drunk or worst. Mocktails follow the invention of the Cocktail, with a lag of a few hundred years. Cocktails were first coined sometime between the 17-19 century according to wikipedia and the oxford dictionary. Mocktails came out in the 20th century with the gaining concern for alcohol awareness and drinking and driving, and as an alternative to cocktails for those who wish to refrain from alcoholic beverages but wish to enjoy the experience of being social, and like mixed drinks. The popularity of Mocktails depends a lot on the region and culture of the area. Bigger cities with more diverse populations and more bars/restaurants are more likely to consider alternative beverages, while smaller communities like my own often only have pop or coffee offered to designated drivers. Ok but I digress. This article is about the next step. Just as Mocktails offer an alternative to sipper drinks like cocktails, what about the alternative to the newer Shooter? And what do you call a virgin shooter so that it is not associated as closely with the shooter who’s sole purpose seems to get the individual drunk in the shortest time possible? So I have to think. Why else have a shooter? In previous posts I mention a shooter also gives a big hit of flavour quickly. 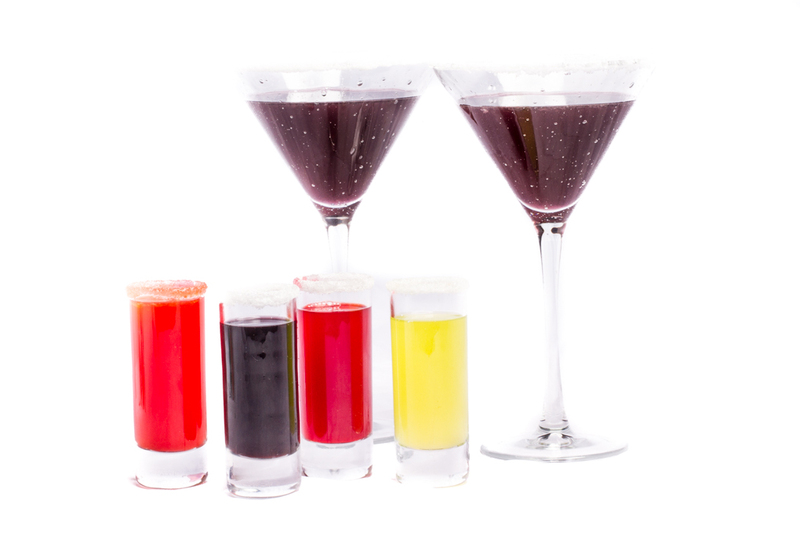 Recently in chatting with young adult who liked making and mixing drinks, shooters are also an art form and fun to make. A friend an teen centre employee compared virgin shooters to water pong. Both are a safe alternative to the “real deal” and hopefully teach youth that there are fun and safe choices out there. My two girls joke that they “shock” teachers by telling them that their mom serves them shooters – they are 7 and 11 – and then explain “virgin shooters”. Fortunately the teachers here know me and what I do well and aren’t really shocked, but imagine a parent hearing that a teen had shooters at a youth event? And if the teen didn’t explain… well, time to rename the virgin shooter. So I introduce to you the Skeeter. (No not the mosquito!) Which won out in my circle over the Vooter (lame), the Mooter (lamer) and the Mockter (which seems to have some other uses). Will it catch on? Probably not. But it took a few hundred years between the first cocktail and the first Mocktail, so give it time… and to my knowledge virgin shooters, or Skeeters, are a new concept first introduced here! 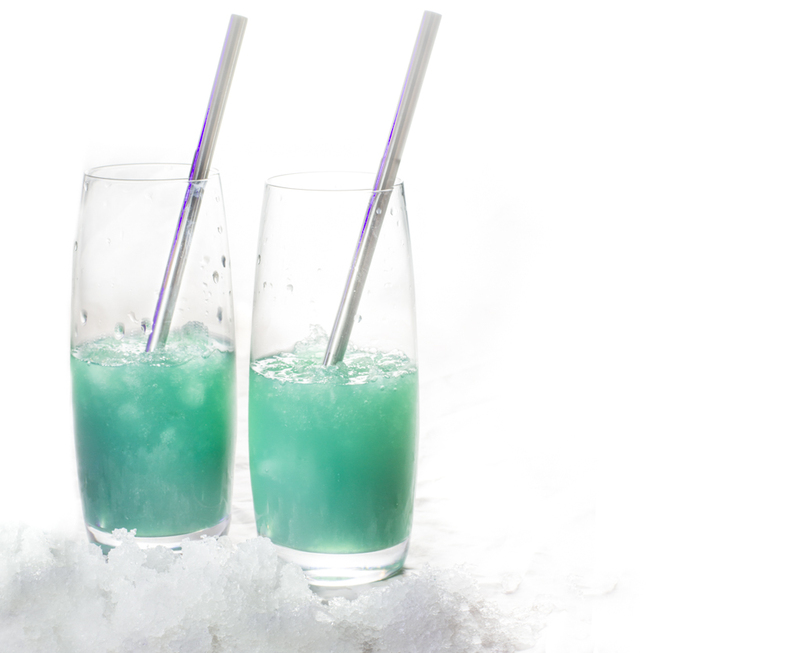 Glacier Melt: a new name for a wicked drink – served over crushed ice for a wonderful new virgin flavour. In looking up drinks to try using the bitters that I had procured in my trip to Vancouver, BC, and while I was in still in holiday mode, I was cruising the internet looking at recipes and came across an drink made with orange juice, orange bitters and curacao along with both dry and sweet vermouth and gin. Being in full holiday mode and awaiting the arrival of Christmas, my brain translated the drink as Santa’s Whiskers – Curled and I thought, what a fun thing to try as a virgin make-over during the holiday! Turns out I was experiencing a dyslexic moment, as the true name of the drink is Satan’s Whiskers – Curled. Oops. Not to be daunted by misspelling, I gamely converted the drink into a virgin creation substituting curaçao for curaçao syrup which I had picked up (but is also simple enough to make with some orange rinds, simple syrup and blue food colouring), white grape juice for the dry vermouth and a blend of apple juice, lemon juice and water for the sweet vermouth. The idea for the substitution was based on cooking substitutions for alcohol which if you are interested you can find here. The result was a fun blue drink, with a nice flavour complex and no name! Without the 2 oz of alcohol, the drink is not as “wicked” as the original and needed a name that fit the new flavour of the beverage. Blend all ingredients in a mixer with ice and shake well. Strain into a old-fashioned glass and serve with a twist of orange. Or serve over shaved ice in a tall glass for an elegant and modern look. This drink received positive reviews from young and old while we were on holidays. Everyone found the beverage tasty and commented on the nice blend of flavours. The addition of the Juniper tea enhances the drink flavour, however the cinnamon was the prevalent flavour and I may reduce the cinnamon by half or less (break the stick into a smaller bit). Depending on what tea you choose to use this drink will vary slightly in flavour. This drink really relies on the blend of flavours, I tried it again later but didn’t have any white grape juice available, the mix didn’t have as much power and presence. If you wish to keep this drink less complex, omit the tea. The drink will change in flavour only slightly, but who’s to know but you? Kid-o-metre 5/5 This drink was enjoyed by my daughters and the adults. Taste: 4.4/5 This drink can be made with or without the juniper tea, and either way it’s enjoyable.. just different. Simplicity: 3/5 If you can find curaçao it is slightly easier, but making the juniper tea increases the difficulty of this drink. Ingredient finding: 2/5 juniper berries, specialty tea and specialty syrups… all need to be shipped in or pick them up on a trip to a specialty store. To replace gin I wanted a infusion or tea that included a blend of flavours. Gin is normally predominantly juniper, but includes such botanicals as orange and lemon peel, cardamon, cinnamon, nutmeg, angelica and coriander among others. According to ginvodka.org there are usually from six to ten flavouring agents (or botanicals) in the gin making process. So for a replacement I chose a tea, and instead of a simple juniper berry tea I chose a tea from DavidsTea called Detox which has juniper, lemongrass, ginger in it’s flavour profile and added about 2 Tbsp juniper berries, cinnamon and a few cardamon pods to the mix. Brew all ingredients for half hour in hot water, strain and cool. Store until needed. Knowing someone who knew the taste of vermouth is very helpful in making a replacement. The description of what to replace sweet vermouth from the website mentioned above include apple juice or a blend of lemon juice and water. I worked out a recipe that my taste tester says is very “vermouthy”. Blend ingredients and chill until needed. I am a big fan of this virgin version of the drink and look forward to serving this to friends in the future. How does it compare to the original Satan’s Whiskers? Mild, very mild, I would guess.